Passenger airlines are airlines dedicated to the transport of human passengers. In 2019, global air traffic passenger demand is expected to increase by 6 percent and generate around 885 billion U.S. dollars in revenue. Some of the largest airlines worldwide include: American Airlines, Southwest Airlines, Delta Air Lines, Deutsche Lufthansa, United Intercontinental Holdings, China Southern Airlines, and Air France-KLM. 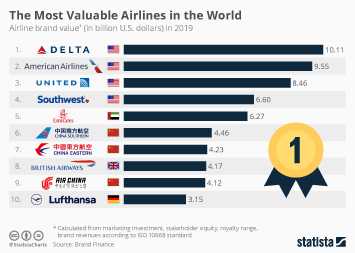 In 2019, Delta Airlines was the airline with the highest brand value, closely followed by American, United and Southwest Airlines. American had an estimated brand value of just over 9.5 billion U.S. dollars. Passenger airlines typically operate a fleet of passenger aircraft that may be either owned outright by an airline company or leased from commercial aircraft sale and leasing companies. Commercial passenger airlines generated combined revenue of around 885 billion U.S. dollars worldwide in 2019. Passenger airlines can be mainline, with flights operated by the airline's main operating unit, or a regional airline that operates regionally over shorter non-intercontinental distances. Passenger airlines may also be low-cost carriers, which provide basic and less expensive services, charter airlines which operate outside regular schedule intervals, or a major airline with at least one billion U.S. dollars in revenue. In light of growing affluence in emerging markets and increased trade relations between a number of countries, passenger demand is fueled by tourists and business people alike. Additionally, Ryanair and Southwest Airlines have revolutionized the airline business with the introduction of innovative low-fare business models, which are attracting a growing customer base.